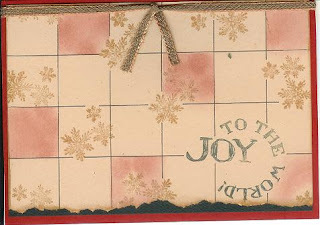 Another use of Club Scrap Christmas stamps--this time from their 2006 set. This is another card done with the grid technique from the Technique Junkies newsletter. Very traditional look, I think. I just hostessed a Christmas card swap with members of the Club Scrap Chat forum. There were about 30 players, each making 10, 20, or 30 Christmas cards. The cards were sent to me, and I sorted and repackaged them, making sure each person got a variety of new cards. A number of players say they are holding onto their new cards as "keepsakes." I will be sending mine out, though, as Larry recently gave me a huge list of people we need to send to this year. Of course, if I send a handmade card to one person, I need to send one to everyone--can't remember the last time I bought a card from a store!